Tiger Paw, based in Surrey, have created an innovative range of products to compliment the Linn LP12 turntable. Their current range consists of the Khan, sKale and Elevator. With the aim of getting the most out of the Linn Sondek, Tiger Paw gives the LP12 user a real alternative to the Linn upgrade path. Tiger Paw have created a new range of products which are designed to complement the LP12 and give real sonic improvements to this world famous turntable. Tiger Paw started off life with the Khan Top Plate, which was a real alternative to Linn’s own stainless steel top plate. It has become a huge success and pushed the Tiger Paw name into the forefront of the LP12 upgrade circle. 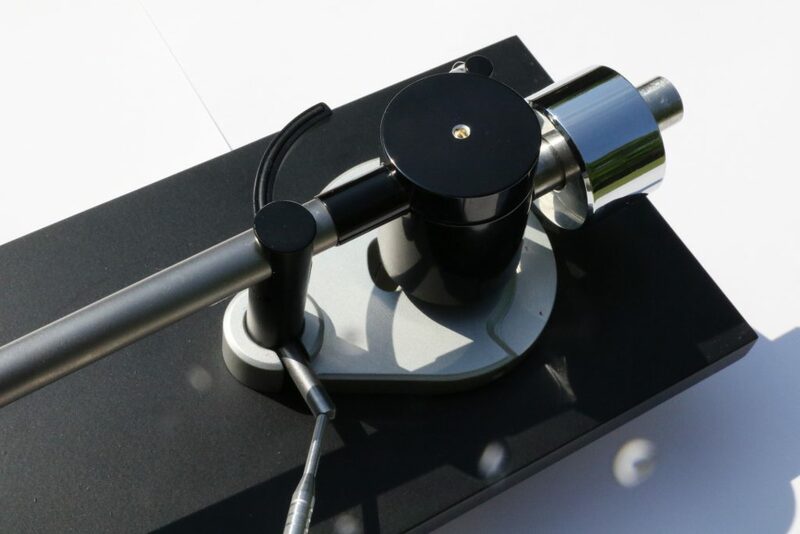 Following on from the Khan, Tiger Paw introduced the sKale counterweight for the Linn Ekos and Ittok, Naim Aro and Roksan Nima tonearms as well as the Elevator Cueing bar for the Naim Aro tonearm. With more products in the pipeline, watch this space for more innovative and exciting developments. From the day Tiger Paw introduced the Khan precision machined top plate the inevitable conclusion would be the development and launch of a fully integrated plinth system in which to incorporate the LP12 mechanics. Accurate record replay is based around precision measurement. Quite simply, the more accurately the record is read the more music you will hear. The LP12 has been proving that for over 40 years. As technology improves, so too does the performance of the player. Stratos plinth has been designed to take that one step further with a unique construction. Each plinth starts life as two solid billets of aluminium. Both blocks are carefully machined in to an upper and lower section. The upper part incorporates the top plate and the top four flutes. The lower section starts at the step of the lower flute and then continues in one piece to include the bottom tray. The two sections are then bolted together to form a rigid structure of immense strength. The precision joint is invisible to the eye being hidden by the shape of the lower flute. Offering an alternative to the traditional Linn stainless steel top plate, the Tiger Paw Khan is a system comprised of 3 parts: a precision machined aluminium top plate, revised studs and fixing bolts, and a machined alloy fixing cross brace. The Khan is machined from a solid billet of aluminium and is dramatically stiffer than the original top plate whilst weighing about the same. Not only does this provide an accurate and stable platform from which to suspend the sub chassis but it also provides a significant reduction in the amount of energy from the motor reaching the sub-chassis and main bearing. One feature of the current steel Linn top plate is that it needs to be stressed and ever so slightly bent to accommodate its fitting to a Linn plinth, this stops rattles and knocks which can cause a dramatic loss in sound quality. In comparison, the Tiger Paw Khan is completely flat. This means that it achieves an accurate fit onto any plinth as well as allowing the sub-chassis bolts to hang completely vertical which is another aspect of the ideal LP12 set up. If the plinth is not perfectly flat, Tiger Paw have also produced the Klamp Kit which allows for the secure attachment of the Khan to the plinth in an additional 3 locations, thus removing any knocks or rattles in the top plate. The Khan components are machined to reduce standing wave formation. Each piece is designed to be inert and not act as a wave multiplier. This has been achieved without increasing the mass of the component, as increasing the mass has been found to be detrimental to the overall performance of the deck. The Khan is a great way to unlock the further potential of your deck and should be a serious consideration for any LP12 owner. A demonstration is strongly recommended. The sKale is a variable mass counterweight designed and produced by Tiger Paw. Versions specifically designed for the Linn Ittok, Ekos or Ekos SE tonearms and also the Naim Aro and the Roksan Nima are all now available, allowing any cartridge to work with them to its full potential. The sKale works by placing the counterweight in the optimum position near to the fulcrum of the arm, the cartridge benefits from reduced inertia, as the mass of the counterweight is being moved less. This is particularly noticeable if you choose to use a heavier cartridge such as some Dynavectors or Lyras. However, the effects are still quite pronounced with medium to lighter weight cartridges such as the Linn Akiva and the rest of the Dynavector range. The sKale incorporates an offset centre hole which serves to lower the centre of gravity of the mass further in line with the stylus and cantilever. The benefits of this are well documented and incorporated into the design of many other high-performance arms. The sKale also features a unique decoupling arrangement to reduce resonance reflection within the arm. A great deal of time was spent analysing and evaluating the impact of using different materials to decouple the weight from the arm; the final choice was arrived at following extensive listening evaluation. Decoupling from the rest of the arm is achieved by the use of three internal rubber o-rings. The adjustment of the mass of the sKale is achieved by fitting additional discs to the rear of the counterweight, secured by three bolts. The sKale is available from stock in Satin Chrome, Satin Black to match Linn arms and also bright chrome to match both the Naim Aro and the Roksan Nima arms. Soon we hope to add the sKale for Rega arms to our counterweight range. Elevator is a new accessory for use with the Naim Aro tonearm. It has been designed in conjunction with Peter here at Cymbiosis to specifically enable easier cuing of the Aro. The original Aro is a uni-pivot design and was not offered with a cuing device but relied on users doing this by hand. The Naim Aromatic was briefly available to assist with this, but has not been available for many years. Elevator is a bespoke solution that is designed to be fitted directly to the Linn arm board utilizing existing components. The Keel/A already incorporates an additional locating point for the Aromatic which needs to be drilled through to accept a single 4mm bolt. If using a standard arm board, the procedure will be the same but the securing bolt will need to be longer. Both of these bolts are supplied with the Elevator and, here at Cymbiosis, Peter will ensure the utmost care and attention is given to this delicate procedure. The Elevator gets round a problem and allows peace of mind while using the Naim Aro. It allows the end user to feel comfortable whilst cuing up, even in the most awkward of low-light situations.